During the use phase, all the application services in an enterprise application process the requests sent by the clients and carry out the actual application behaviors. If you are getting your raw bean (after normal instantiation using the XML configuration) from the application context, as above, there is nothing special and interesting happening. If your special BeanPostProcessor wants, however, getting beans can become more interesting. Instead of returning your raw bean as is, it can wrap your bean inside a Spring proxy, which in turn can expand the capabilities of your raw bean. As Spring revolves around the dynamic proxies for doing many of its framework-related activities, this is very important and helpful for a Spring developer. Your bean can become more powerful in your enterprise application by handing difficult application features, such as transactions and auditing. In the destruction phase, all application services release any system resources already allocated and also keep the instances/objects ready to be garbage-collected. 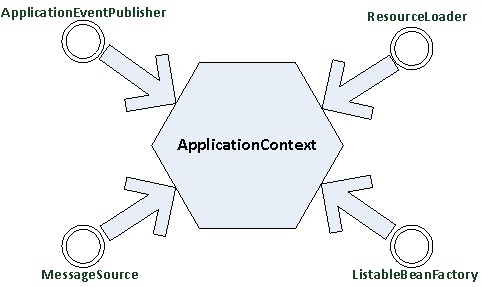 Closing the ApplicationContext triggers the destruction phase in your Spring application. The preceding routine destroys all the beans, which makes it ready to be garbage-collected and also destroys itself, meaning that you cannot use it again in your application. When bean destruction happens, if the bean has registered itself with destruction callbacks, it will get invoked by the Spring Framework. This is usually done to explicitly release resources that the bean is holding and to perform some necessary cleaning activities. An easy way to register a bean to receive destruction callbacks is to have a method annotated with the JSR-250 annotation javax.annotation.PreDestroy. Registering destruction callback using @PreDestroy annotation is done as shown in Listing 3-19. Using the marker interface org.springframework.beans.factory.DisposableBean is a, useful way for Spring to perform certain actions upon bean destruction. For beans implementing DisposableBean, it will run destroy() after Spring container has released the bean. If you would like to register the destroy callbacks for the bean using the destroy- method, perform the actions shown in Listings 3-21 and 3-22 in XML configuration and Java code. Best Practice: It’s always good practice to use the init-method and destroy- method in the bean configuration file, instead of implementing the InitializingBean and DisposableBean interfaces, in order to avoid coupling your code to the Spring Framework. The simplest way of getting bean instance in your application is shown in Listing 3-23. If you have the type unique in your XML configuration, you can even get bean instance, as shown in Listing 3-24. Currently there is a debate as to whether we defeat the principle of IoC by accessing the bean in the above manner. Another way of getting bean instances in your application is to have the autowiring automatically done by the Spring container. By doing so, you are not tying your application to Spring Framework, and this would be a better way of treating the principle of IoC rather than typing your code to the Spring container. I explain the autowiring concept in detail in subsequent chapters.